Originally used as a Fidelity Bank Advertisement in 1958, Expect the Unexpected was reproduced by Circle Gallery in 1975 as a limited edition fine art print. This monolithograph consists of 295 impressions, measuring 20 by 17 inches. 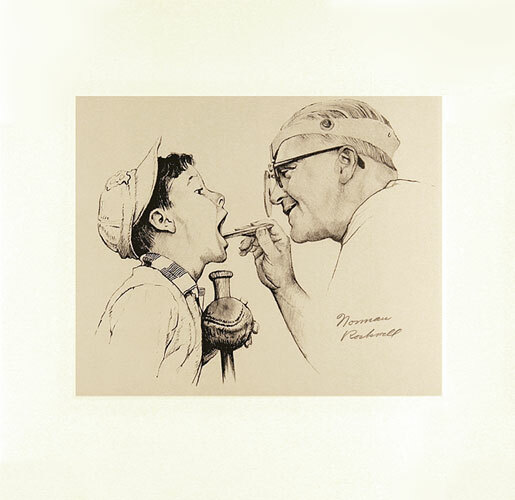 200 were numbered and 60 artist proofs were signed in pencil by Norman Rockwell. An additional 35 prints, pencil signed and designated with roman numerals, were reserved for the artist. The purchase of any limited edition Norman Rockwell print is accompanied by authenticity certificate signed by our museum director. Purchases come with a museum family membership and care and handling instructions for the print. Payment may be made through our interest free 10 month layaway plan. All fine art purchases contribute directly to the museum endowment. Please ask for more assistance.